Greater Los Angeles Area Council is a local council (#033) of the Boy Scouts of America located in the states of Southern California. GLAAC was formed in July 2015 from the merger of Los Angeles Area Council (#033, formed 1915) and San Gabriel Valley Council (#040, formed in 1919). The vote to merge was held on March 21, 2015. 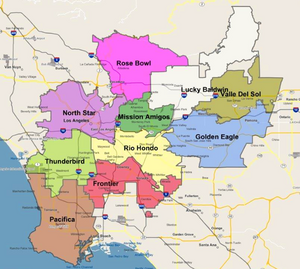 The new name for the Council, Greater Los Angeles Area Council, was announced on June 11, 2015. The new Council will continue with Scouting Service centers in Los Angeles and Pasadena. GLAAC has three Scout shops located in Los Angeles, San Pedro and Pasadena. Also in Pasadena is a local service center. GLAAC operates seven camps in the greater Los Angeles area. Due to the large size of the two original councils, the merger was a process that was completed over a time span, the merger was completed in 2017. Founded in 1915, the Los Angeles Area Council (LAAC) (#033) served most of the City of Los Angeles as well as several other cities in the greater Los Angeles area. It was one of five Boy Scouts of America councils in Los Angeles County, California. Since its founding in 1915, the Los Angeles Area Council served millions of youth, 54,567 youth in 2008. The Los Angeles Area Council was founded in 1915 as the Centinela Council, changing its name in 1925 to the Los Angeles Council. In 1934 the San Antonio District (#046), founded in 1922; and the South Pasadena Council (#067), founded in 1927 merged into the LAC, with the name of the organization changing to the Los Angeles Metropolitan Area Council. The council name changed to LAAC in 1945. The LAAC was one of the first councils organized in the United States and is one of the largest councils still in existence. Located in Los Angeles County, California's San Gabriel Valley, the Boy Scouts of America's San Gabriel Valley Council (#40) was one of five councils serving Los Angeles County, headquartered in Pasadena. With the founding of the BSA in 1910, the first goal of the San Gabriel Valley Scout leaders was to organize as new troops. Paid professionals, many of whom were YMCA leaders, were recruited to help start new Troops and spread the new Scouting program. They were sent out into the San Gabriel Valley towns to organize new troops and recruit leaders. By March 1919, there were nine active troops with 190 boys in the San Gabriel Valley. The Pasadena Council (also known as the Pasadena District Council) of the Boy Scouts of America was organized March 3, 1919, with jurisdiction over Pasadena, Altadena and Lamanda Park. A charter was granted by the BSA National Headquarters dated April 1, 1919 to the Pasadena District Council. Tallman Trask was hired to be the first Scout Executive. Trask had been a District Executive for the Los Angeles Council. He had also served as Los Angeles' Camp Director. Prior to joining the BSA, Trask was an executive for the YMCA and had run several camps for them. By October 1, 1919, there were 15 active troops with 299 Scouts. The east part of the San Gabriel Valley Council came from the dissolved Old Baldy Council on May 1, 2006. North Star District - Eagle Rock, Hollywood, East L.A.
With the 2015 merger of the two councils, GLAAC now operates 7 scout camps. 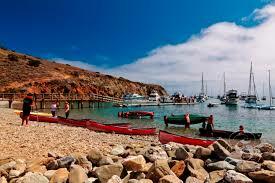 Camp Cherry Valley - Located on Santa Catalina Island 22 miles off the California coastline. Camp Trask - Weekend wilderness camping in Monrovia Canyon. Camp Holcomb Valley - Scenic mountain meadow near Big Bear that can host wilderness camping and is near the Pacific Crest Trail. Firestone Scout Reservation - Cubland and Scout World camping facilities and shooting ranges near Diamond Bar CA. Camp Big Horn (Aka: Hubert Eaton Scout Reservation / AKA: Forest law Scout Reservation) is a large scouting summer camp program in the mountains near Lake Arrowhead. Log Cabin Wilderness Camp - Hi-Adventure Base for Sierra Trek venturing. Located at the base of the Inyo National Forest. Sea Scouts give service to others. The element of water makes Sea Scouts unique. Sea Scout units use a variety of boats, from outboard motorboats to large sailing yachts. Tuku'ut Lodge 141 - Order of the Arrow (Totem: Saber-toothed cat) The Greater Los Angeles Area Council is served by this Order of the Arrow Lodge. This page was last edited on 27 August 2018, at 19:13.